We were getting a little overconfident, is my guess. The Dog Gods looked at us and said, “Those two are acting as if they got a perfect puppy. Mwah-ah-ah! Let’s show them a thing or two!” Kyndall has typically been waking in the middle of the night, and she did that again, whining around 3:15 a.m. Steve took it for the team, lugging her out into cold. She pooped and peed, and we told ourselves she really did need to relieve herself. But then she woke us with more whining at 4:30. I reprimanded her and ordered her to be Quiet! She persisted, and I took her out again. To my amazement, she pooped and peed again. Steve and I struggled to get back to sleep and only half succeeded. Around 6, I began to hear Kyndall stirring at first and then whining again. I got out of bed, dressed, and took both her and Tucker outside into the pre-dawn gloom. Incredibly, she once again urinated and defecated in quick succession. Steve says this is Kyndall’s impression of a moray eel. I need to add that none of these solid waste deposits resembled diarrhea. But when she went yet again a few times throughout the day, things began to look looser and more suspicious. Now we’re speculating she may have swallowed some of those twig bits and palm-tree seeds she’s been snatching up and chewing on, and maybe it irritated her digestive track. We can only hope it clears up soon. Not only do we desperately need a good night sleep in preparation for the looming New Year’s Eve festivities (to which she’ll accompany us), but there’s a cold wet storm blowing in. If it was unpleasant going out into the dark and cold last night, it will be worse tonight. Once again, it strikes me that it’s a good thing puppies, like infants, are so adorable. Otherwise, it might be tempting to lose one’s temper with them. But who could do that when they look like this? 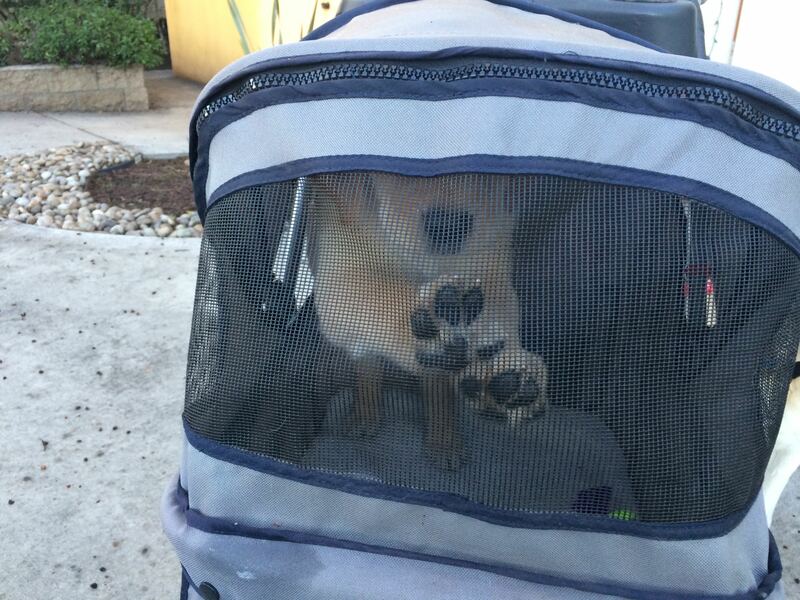 Two puppies ago, for Darby, a friend loaned us her dog stroller. As ridiculous as it might seem, the stroller won our affections. When you’re raising a CCI puppy, one of your most important missions is to train the dog to walk nicely on a leash; any service dog-wannabe that pulls and jerks its handler would be a disgrace. 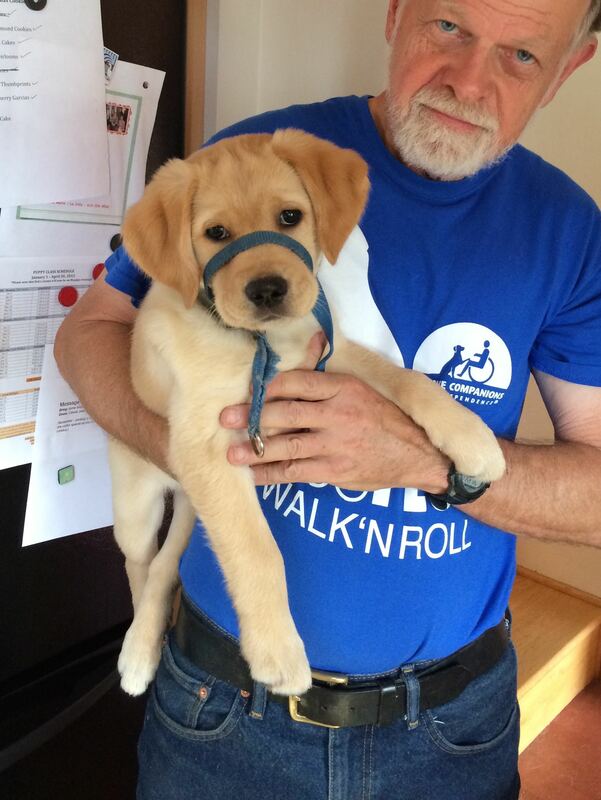 It can take weeks to introduce the puppy to proper walking (and months to perfect it). Rather than give up my morning walks to my local coffee shop or our weekly hour-long hikes up Mt. Soledad during this teaching phase, we plopped Darby into the borrowed stroller and took her along that way. When we acquired Dionne (puppy #5), I found a lightly used stroller on Craig’s List, bought it, and once again found it to be useful. 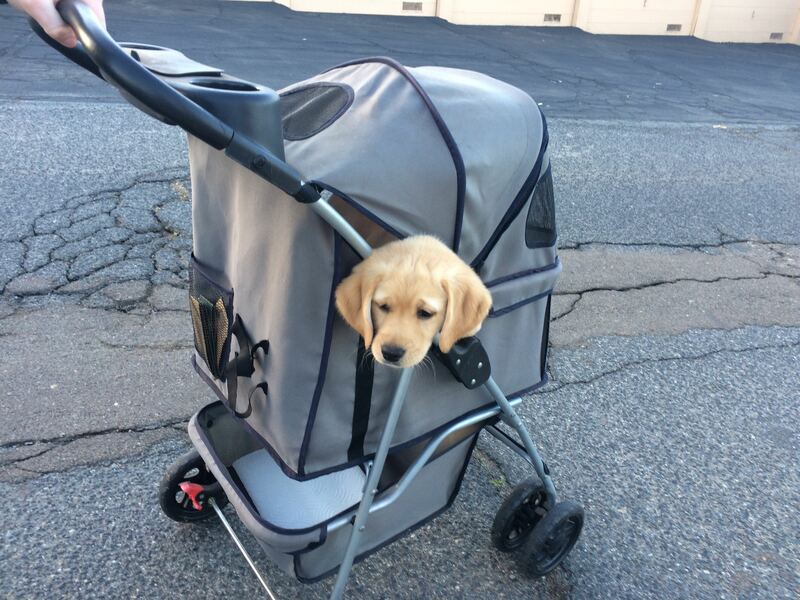 The stroller phase is so short I felt a little guilty for paying for even a second-hand puppy pram. But now that we’re using it for Kyndall, I’m so glad I did. As with Dionne, Kyndall screeched and barked and yowled the first time we put her in it. Like her predecessors, she jumped out several times. We had a leash snapped to her little collar, so she couldn’t bolt away, and as alarming as this maneuver looks, the puppies seem to survive the plunge unscathed. We then zipper them in, which they hate. But now she’s doing much better. Yesterday, we strolled her, unzipped, all the way up to the top of the mountain, then stopped at the coffee shop, an almost 2-hour excursion. She didn’t leap out once, and kept the verbal complaints to a minimum. It’s pretty clear she’d rather be trotting along down on the ground, rather than looking down at it. But that will come soon enough. 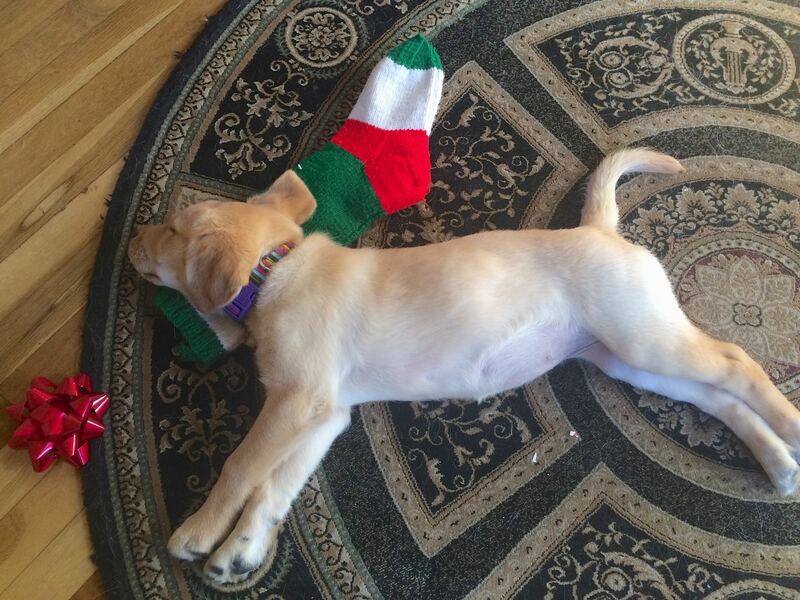 Kendall’s Christmas gift to us was to sleep almost all day long. She took breaks every now and then to watch us open presents, play, and look adorable. But she astounded us by how much she slept. She snoozed for several hours in the morning. Then she slept most of the afternoon. After a break for dinner, she drifted off again. She capped all this off by sleeping from 10 p.m. until 4:45. We’ve never experienced anything like this before. Our last puppy, Dionne, slept during the day only rarely, and on prior Christmases when we had young dogs, they attacked the tree and occasionally threatened to bring it down. 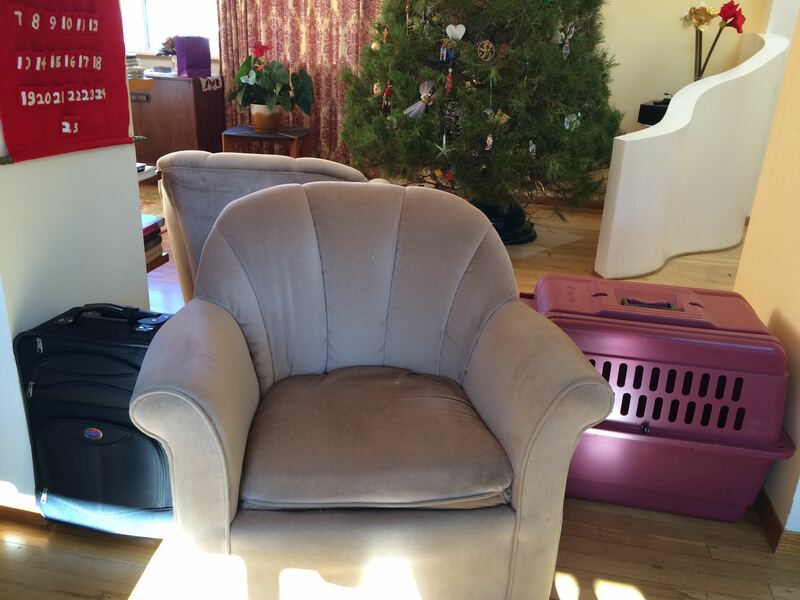 Given this history, this year we rigged a barricade between our kitchen area and the Tree Attack zone that’s both ugly and inconvenient. But it’s effective. Given how sleepy Kyndall was yesterday, however, we felt comfortable in dismantling it by the end of the afternoon. 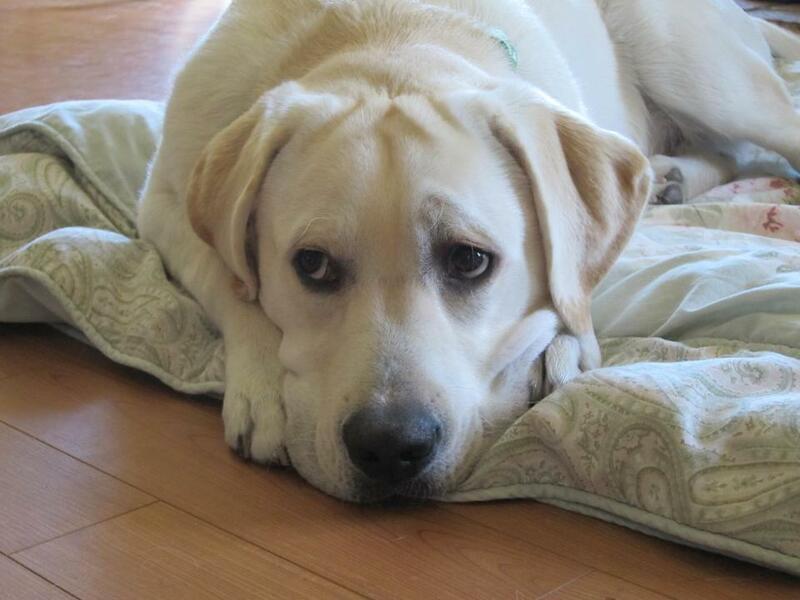 One sad note was struck not by Kyndall but by Tucker, our 10-year-old CCI release dog. Tucker has long adored Christmas for its association with rawhide pigs’ ears. He’s gotten them in the doggy stocking for many years, and he typically walks around with one in his mouth, wagging and wagging his tail as if the very thought of what he was about to consume filled him with happiness. Then he chomps them briefly and swallows them like potato chips. We’ve allowed him to eat two or three some years; it never seemed to phase him. But this year, after a single pig’s ear he was making scarily nauseated noises. Clearly, his aging digestive system cannot handle them any more. Rawhide chews are forbidden to CCI puppies, so Kyndall didn’t come anywhere near one. Our gift to her was a Nylabone set of puppy teething keys. She gnawed on it for a few minutes. Between naps. One of the most common questions I’ve fielded over my years as a puppy raiser is, “Why does your dog have to wear a muzzle?” First, I reply that the straps around my puppy’s muzzle aren’t a muzzle, but rather a Gentle Leader “It’s like a halter for a horse,” I chirp. “She (or he) can eat, drink, lick, bark, and even bite with it on — not that one of our puppies would ever dream of biting anyone.” The second part of the answer is that the puppy is wearing it because CCI says all puppies should start wearing their Gentle Leader or Halti (another brand) as soon as possible. It gives the puppy raiser and (later) the professional trainers much more control than a leash attached to a collar. 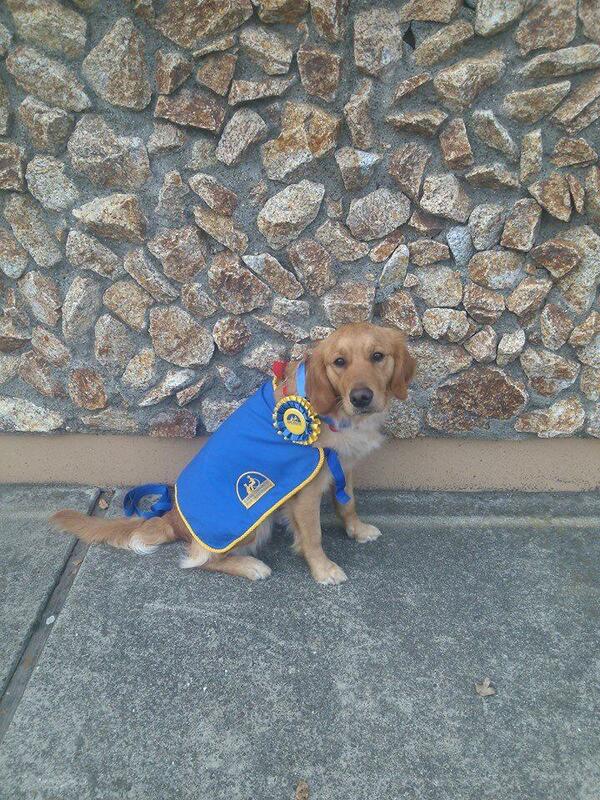 What I usually don’t go on to say is that most puppies despise their halters. They claw at them as if their whiskers were on fire; they try to rip them off. Often they succeed, and we’ve had more than one puppy chew up and destroy a brand-new Gentle Leader, ensuring that it, at least, won’t torture any more innocent young animals. With Kyndall we did not start with her first meals, however, as she appeared to be such a dainty eater. She’ll chomp through a half or two-thirds of the cup of puppy chow we give her three times a day, then abruptly turn away. She’s done. It seems to be going okay so far, though we haven’t yet tried the next and much harder step: attaching the halter to both Kyndall’s nose and to a leash and trying to get her to walk with us with it on. That event will come soon, but for the moment, she has her own regimen for training us. 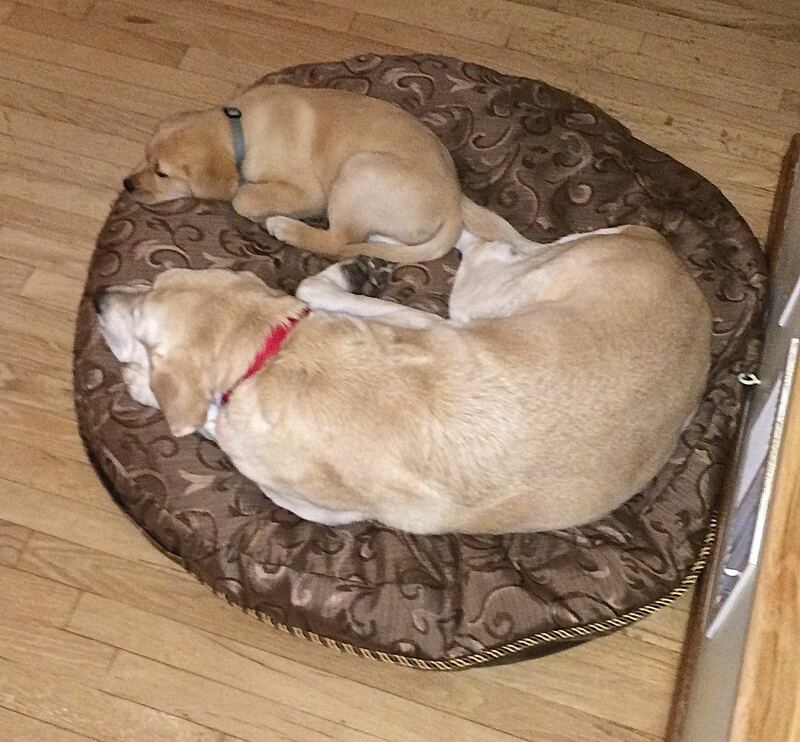 One of her first goals is to make Tucker tolerate her cuddling up to him on his bed. He hates this idea. He’s pretty sure (from sad experience) that any such cuddling is likely to quickly devolve into nipping and wrestling. But last night he was so sleepy he put up no resistance, and she enjoyed a few sweet moments (before being ushered into her sleeping kennel). Steve and I are both smitten by Kyndall. Her cuteness is a force of nature, and so far she’s easy to live with. At the same time, many of our most urgent waking thoughts are devoted to changing her. She comes to us, as all puppies do, a creature that has spent almost every moment of her existence in a puppy mosh pit — a fragrant, wriggling mass of soft fur coating warm little bodies. They eat, pee, and defecate whenever they feel the urge; fall into deep sleeps when they’re tired and wake when they’re not. Whenever they want a buddy to chew on or wrestle with, they can always find one within the reach of a small paw. Then one day, they’re separated (forever) from their doggy family — scooped up and into a hard, cold crate, and loaded onto cars and a plane for the journey to the Oceanside facility. In their puppy-raiser’s homes, they’re immediately expected to pee and poop only outdoors and to adapt to an entirely new schedule for sleeping and playing. Later we’ll think about refined activities such as Staying and Rolling and Jumping and Speaking. For now, it’s more primal. Sooner or later, we know, she’ll get with the program. She’ll also stop looking like a tiny beautiful doll. We’ll love her less then for her beauty. But we’ll feel more and more connected to the increasingly well-behaved member of our pack. Thanks to the Internet (and the legacy of Mark Zuckerberg), our life with Kyndall has started off with a lovely bonus. Within just hours of Kyndall’s arrival and my subsequent post, I heard from the woman in Union City, California who raised Kyndall’s mother, a golden beauty named Sophie. She now has one of Kyndall’s sisters, Kihei, and she’s formed a Facebook group for the folks who are raising Sophie’s “K” litter (or at least all those she can find). and her studly father, Verl. I’ve never before had such an extensive connection with one of our CCI’s pup’s litter mates (and their puppy raisers). CCI has never actively fostered such connections, to my knowledge, though they can develop in various ways. Our fourth puppy, Darby, came from the first-time litter of some very enthusiastic breeder-caretakers from whom we heard often, in e-mail. I also got occasional messages from some of Dionne’s extended family members. But I never heard anything from anyone else connected to our first three CCI charges. I hope the current group stays active. It could be interesting to compare notes on how the individual dogs progress. 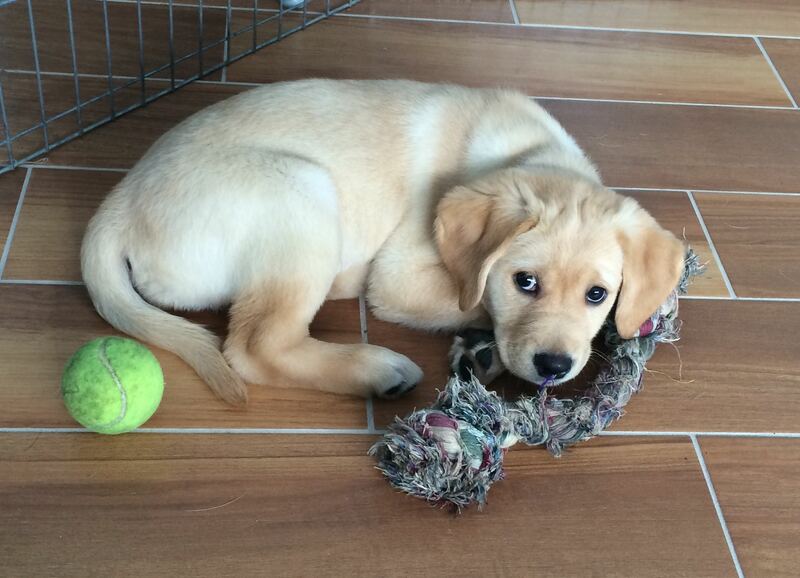 Puppy makes Jack Bauer’s life look dull! Some time must be devoted to sleeping. Though not much. The first 24 hours of life with a a new puppy are filled with action. Those first days also share many things with the fictional Jack Bauer’s life: lots of racing around; occasional episodes involving torture (e.g. sleep deprivation); a constant vigilance to spot and thwart terrorism. I must admit that the terrorist acts committed by Kyndall in her first day with us have been trivial. She ripped a tin ornament from its spot on a lower branch of the tree, and she’s made a start on shredding the doormat inside Steve’s office. But the threat is there, even with as gentle a soul as Kyndall appears to be. This is not surprising. Just as babies explore the world by putting things in their mouths, puppies seem driven to first smell and then try to sink their teeth into everything they encounter. So far, Kyndall has surprised us in a couple of ways. We’re shocked she hasn’t gobbled down the cup of kibble we’ve given her for each meal. She eats a half or two-thirds of it, then turns away from the bowl. But she’s a dainty girl — just 12 and a half pounds when we weighed her yesterday. (In contrast, Dionne was a chunky 16 pounds on arrival.) We’re startled by how vigorously Kyndall wags her tail. Some of our pups have taken weeks to become assertive waggers, but Kyndall’s tail could churn butter (as unsavory as the product might be). Everything new must be sniffed. And everything is new. We’re also surprised — and gratified — by how readily she’s been responding to our command to “Hurry!” when we take her outside to pee or poop. She seems to get it, and so far she hasn’t once urinated or defecated in the house. We know this flawless record can’t last. But it does feel like we’re off to a remarkable start. One surprise she has failed to have is falling into the icy-cold pool. But that too will probably come. The second 24 hours have barely begun.